Whether you’re in college or you have children that will go to college, you should be thinking about life insurance. Term life insurance is designed to replace income if you were to die prematurely. Parents who want to send children to college need life insurance and if you’re a student whose parents co-signed loans for you, then you may need life insurance too. Let’s take a closer look at these two situations. The American higher education system is designed with the assumption that parents help pay for their children’s college tuition. If a student is applying for financial aid, the application asks for the annual household income to determine how much aid that student is to receive, even if that student is going to be paying for the tuition on his or her own. 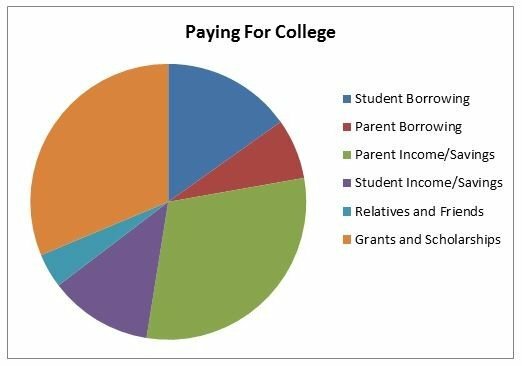 The chart below shows how the typical family paid for college in 2014. As you can see, a large bulk of students had their tuition paid for by their parents. Parents, it’s recommended to start saving early if you plan on paying for your children’s tuition. College isn’t cheap. According to the Huffington Post, since 1982, the tuition costs at private nonprofit four-year colleges have increased by more than 150 percent and the tuition costs at four-year public colleges have increased by 250 percent. Life insurance is crucial for parents to ensure your children are taken care of financially if you died prematurely. College is an investment in your children’s future and if you plan on paying for it, or contributing to it, be sure to take into consideration the cost of tuition when buying life insurance coverage. A $100,000 life insurance policy will take care of funeral expenses and a good portion of the mortgage payments, but it won’t go very far in paying for college. Forbes predicts that in 10 years the total cost of tuition and fees will be between $65,590 (in-state public tuition) and $224,124 (private). That’s a lot of money. 529 plans are great accounts to invest in to help you save for your children’s college years and life insurance will be there if you die too soon and still want to ensure their tuition is covered. Our needs analysis tool is easy to use and very helpful in determining how much life insurance coverage you may need. Give it a try. Term life insurance is very affordable and if you’re a college graduate whose parents helped you pay for college by co-signing loans, a term policy will cover the loan amount if you were to pass away. Sometimes grants and scholarships don’t cover the entire cost of tuition and some parents will opt to co-sign private loans for their child. If parents co-sign, this means they are responsible for the debt if their child does not or cannot pay off the loan. Term life insurance is very affordable and if you’re a college graduate whose parents helped you pay for college by co-signing loans, a term policy will cover the loan amount if you were to pass away. The sooner you buy life insurance, the less expensive it is because of your age and you likely do not have any health issues. If you plan on having a family, buying life insurance young may be a very smart move as well so you are able to get a large policy for very little per month. As an example, a healthy 24-year-old male can purchase $500,000 in coverage that will last 30 years for as little as $31 per month. Even if this individual doesn’t have his first child until he’s 35-years-old, his policy will still cover him until his first child turns 19. If you bought a policy when you’re younger and determine you need more coverage than what you currently own, you can layer policies. As an example, if you purchased a $100,000 20-year term policy as a graduate to simply ensure your parents can afford to pay off the co-signed loan and your funeral expenses if you were to die, but ended up having a family a few years later, you can purchase an additional policy, such as a 20-year $250,000 policy for more coverage. Another option would be to convert the term policy into a permanent one. Most term policies have a conversion option. If you have any questions regarding life insurance, contact us here at Quotacy because we would love to help. If you’re ready to start shopping for life insurance, give our term quote tool a try. It’s easy to use, you don’t need to enter any contact information unless you decide to buy, and you’ll instantly be able to view quotes from multiple life insurance companies.